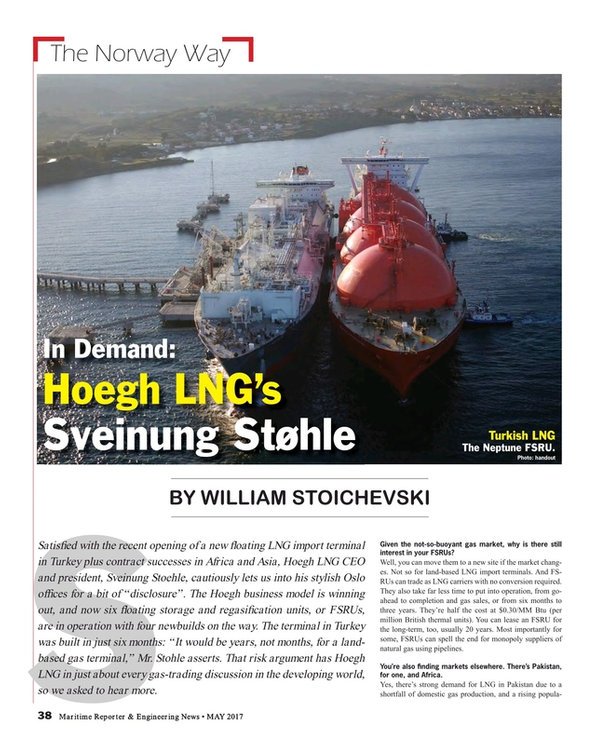 Satisfied with the recent opening of a new floating LNG import terminal in Turkey plus contract successes in Africa and Asia, Hoegh LNG CEO and president, Sveinung Stoehle, cautiously lets us into his stylish Oslo offices for a bit of “disclosure”. The Hoegh business model is winning out, and now six floating storage and regasification units, or FSRUs, are in operation with four newbuilds on the way. The terminal in Turkey was built in just six months: “It would be years, not months, for a land-based gas terminal,” Stohle asserts. That risk argument has Hoegh LNG in just about every gas-trading discussion in the developing world, so we asked to hear more. Given the not-so-buoyant gas market, why is there still interest in your FSRUs? Well, you can move them to a new site if the market changes. Not so for land-based LNG import terminals. And FSRUs can trade as LNG carriers with no conversion required. They also take far less time to put into operation, from go-ahead to completion and gas sales, or from six months to three years. They’re half the cost at USD 0.30/MM Btu (per million British thermal units). You can lease an FSRU for the long-term, too, usually 20 years. Most importantly for some, FSRUs can spell the end for monopoly suppliers of natural gas using pipelines. You’re also finding markets elsewhere. There’s Pakistan, for one, and Africa. Yes, there’s strong demand for LNG in Pakistan due to a shortfall of domestic gas production, and a rising population, and that was our latest contract signing. FSRUs have grown from zero to 22 worldwide in short order. It’s still a low number but a market growing quickly. There were six (floating LNG) contracts signed last year alone. There is no risk of overcapacity due to the (USD) 300 million to (USD) 400 million price tag. Where’s LNG demand coming from now? Last year was the first year of strong demand growth since 2013, although in larger markets demand has been flat. Demand in 2016 increased 17 million tons, or 7.5 percent compared to 2015, mostly from China, India and Egypt. In those types of markets, for an FSRU, 1 million tons a year is sufficient demand. We can deliver anything from 1 MMt to 6 MMt on our FSRU units. The customer can increase capacity as they fit. There are several tenders outstanding, including the Ivory Coast. We see four to five contract awards a year for the next four to five years. People are really starting to appreciate how fast we can do a project. So what’s next for Hoegh? Well, 2016 saw new contracts plus equity raising in New York and financing in Oslo. We need both the New York Stock Exchange and Oslo Stock Exchange to finance our projects. We always have the equity portion (USD100 million) in the bank when we’re ordering a new FSRU. Right now, we have nine long-term charters. Our 2016 revenues were USD220 million, and we expect that to double in 2020. We could borrow more, but we do not want have to have a lot of debt on the balance sheet. Finally, we always have at least one FSRU on order without a contract. Always. This is the business model that’s been successful for us (and) we’re one of a very few companies placing orders these days.